Would you like PenLight to consider a contribution to your group or activity? Submit our Request Form (pdf) to newsletter@penlight.org. All of us at PenLight are grateful to live and work in a great community with good neighbors and so much natural beauty. That’s why we strive to do our part in helping make the Gig Harbor and Key Peninsula area an even better place to be. You’ll see PenLight employees volunteering on little league fields, organizing and participating in blood drives, supporting our local schools, and working to help the less fortunate. We also partner with local organizations to further support our community. As a locally-owned, non-profit cooperative (directed by elected representatives from our community), we have your interests in mind. The following list shows some of the many ways we have chosen to get involved. We encourage all of our neighbors to support our community too. 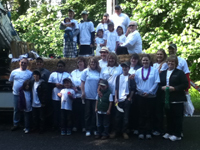 PLC is a continuous sponsor of Gig Harbor’s annual Maritime Gig Parade and celebration. Employees came in first place two years on funds collected for cancer research. 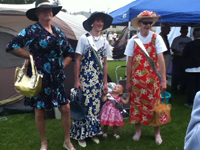 In addition to getting sponsors for the relay, employees held a silent auction, car wash, and barbecue. Individual employee payroll deductions were matched by the company. The PenLight Board was also very generous in contributing funds to this worthy cause. PenLight helps the elderly through referral and outreach services. Each year, PLC provides three local high schools (Gig Harbor High, Henderson Bay High and Peninsula High) with a $2,000 scholarship each. PenLight contributes $3,000 annually to the PSD Education Foundation. For years, PenLight Journeyman Linemen have conducted safety education demonstrations at local elementary schools. 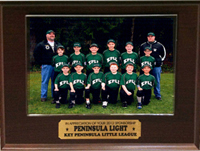 Each year, PenLight sponsors the Gig Harbor and KPLL baseball teams. 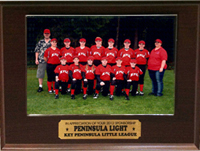 PenLight helped to build the new Gig Harbor ball field, including light poles, power, and use of the land that used to serve as our pole yard. PenLight also pays for the electrical for the KPLL ball field. PenLight has worked with the Peninsula School District to establish, implement, and fund this student-run station. The station is also used as an emergency broadcasting center for PenLight (we have broadcast facilities on-site). Members can tune in during severe outages, storms or disasters for updates.